Overshare is a Working Not Working event series and podcast that features honest conversations with our favorite creatives about the tough stuff we don't talk about in public often enough. 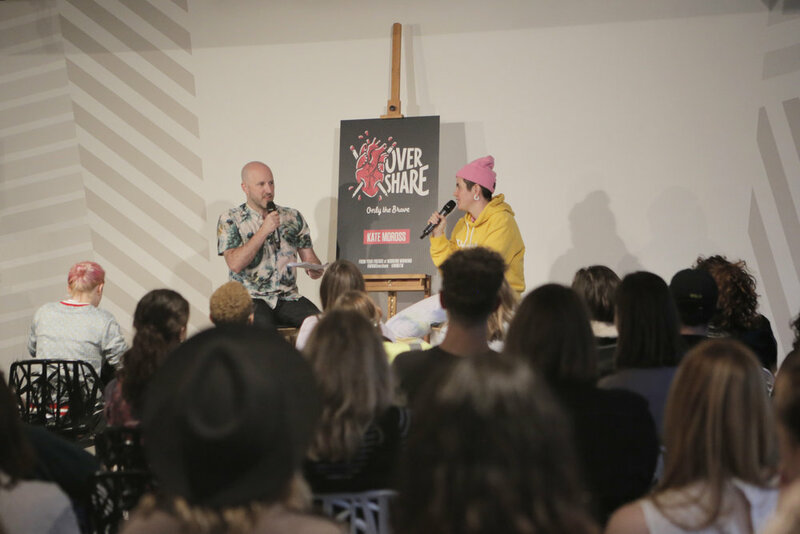 For our 8th episode, WNW co-founder Justin Gignac talks to Member Kate Moross in the first London edition of Overshare. Kate Moross is a multi-tasking and colourful illustrator, art director, director, and designer. She's also the Director of Studio Moross, which has created recognizable and unforgettable work for the likes of MTV, Disclosure, Sam Smith, Ray-Ban, Dreamland, Vice, Young Turks and One Direction. When interviewing creatives, we're always curious if creativity was in play at an early age or more of a career shift later on. For Kate, it was the former: "My mom used to hire art students to babysit me instead of babysitters. So I would be making things out of balsa wood and all sorts of strange friendship bracelets and dollhouse things." And while her parents always encouraged her creativity, she also took plenty of liberties in carving out her own identity. "I was encouraged not to pierce every part of my body and get tattoos everywhere, which I did do. And shave my head and various other things when I was younger. But I think my dad eventually got over that, the stigma that he thought would be attached to me if I looked like, I dunno, an urchin." Kate offers no shortage of helpful and hilarious insights on how she got to where she is now, from what goes into building and managing your own studio to handling creative rivalries, lawyers, and big companies that steal your work. Kate also flips the coin and offers advice on how creatives can avoid the trap of accidentally mimicking another artist: "I try and make it a rule in the studio: never have another piece of work on your screen while you're making work. If you have an internal memory of references and things you've absorbed over time, they will reknit themselves to a slightly distorted version of that concept or that visual thread. And then it will come out in a different way. And that's you. That's how you form your identity as a designer. Don't ever copy one to one." The quality and quantity of output coming from Studio Moross is pretty staggering. While Kate favors designing tours for musicians, she'll be the first to note how much work is involved. But that doesn't mean she doesn't somehow find time to binge-watch TV. "If you're watching a TV show and talking about, I'm watching it too... I've completed Netflix." For all of her creativity on full, brightly-colored display, Kate doesn't tout her own artistry. "I'm just a logical person that does things. I don't consider myself 'creative'... I'm a teacher's pet that happens to draw pictures." For those of you stateside who couldn't join us, we have good news: you can listen to the entire conversation below on our podcast. Subscribe to Overshare on iTunes, Soundcloud, or with any other podcasting app via our RSS feed.